There’s seven of them hanging on my living room curtains. Thirteen dead ones are lying on the floor. (yes, i know someone should sweep around here). Three flew out of the barbecue grill when I lifted the lid tonight. I watched one actually crawl into an electrical outlet. They’re in my car, my laundry piles, and occasionally my hair. Here’s a picture of my front door. It doesn’t do it justice. 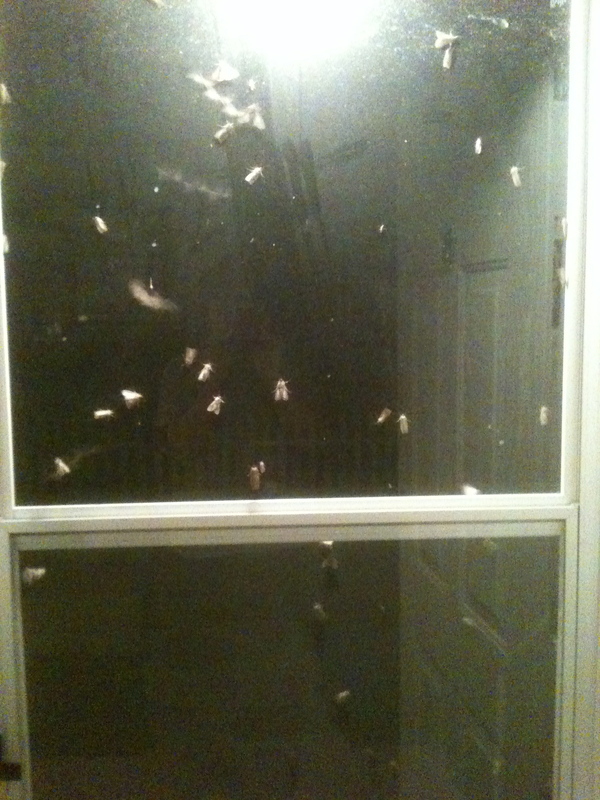 What has caused this influx of moths? Or do you call them millers? I remember several years back they were in excess numbers, much like this year. On the ceilings, the walls, swarming around the lights. Everywhere. My mother called the city. “I want to know what you plan on doing about the millers in this town,” she complained. The city officials wanted to know who the Millers were and what exactly they were doing wrong. They thought she was referring to a family by the name of Miller. Needless to say, I don’t think any action was taken. They’re bad here in New Mexico too! That is hilarious about mom, why didn’t I know that story…made me LOL!! Funny. My picture for today was a moth. I guess they are everywhere – literally. Oh my gosh, I just about (you know what) in my pants laughing at this post! Well, acutally … mostly about your Mom and the Millers! We went to visit my daughter and her family a couple weeks ago and they were complaining about the lady bugs at their farm, particularly in their dining room around the light on the ceiling fan! So, we are in the kitchen making dinner and all of a sudden, we hear this noise and my son in law had gotten out my daughter’s NEW Dyson and was sucking up all these lady bugs in the vacuum! (and I’m not talking about a “couple” bugs, I mean LOTS of them! I actually thought my daughter was going to have a heart attack!!! (Only a guy would do that, right??) So we took it outside and opened it up and tried to let them go. I can’t even begin to tell you how weird it was to see these little bugs trying to get out after being in that “tornado” for a few minutes. There were lots of little “dizzy” lady bugs in Iowa that night! The lesson here … don’t put bugs in your Dyson; it’s not a pretty sight and messy to clean up! Sorry about the long reply! And sorry about the moths, they are messy as well! Until next time .. Donna H.